http://www.line-stickers.com/ – Taitsukun Line Sticker | All the feelings of love expressed in a delightfully weird way! Perfect(?) for expressing your true feelings to your other half. True love? Err.. BORING!! For all of you who have given up on love: Taitsukun’s sticker is back! Will he be able to bounce back from the abyss? Look! Taitsukun is all dressed up and he’s here to make you and your friends happy! 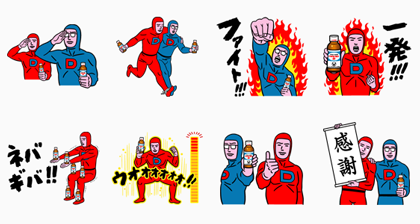 Deliciously refreshing Kirin Mets Cola has teamed up with the spandex-wonder Taitsu-kun to bring you these slamminʹ new stickers! Friend Kirinʹs official account to get this set and quench your thirst for fun. Available till November 24, 2014. Copyright : Copyright © Sui Sui, Ltd | Taisho Pharmaceutical Co., Ltd. Previous post Lee-Yuri is Here!